The twenty one pilots Blurryface Live Vinyl here is a 3LP, tri-gatefold picture disc vinyl featuring the live audio recorded at the Fox Theater in Oakland, CA. The vinyl does not include a digital download of the files. The twenty one pilots ‘Goner Box’ women's t-shirt features a pattern from the ‘Blurryface’ album art. The design features the lyrics “Don’t Let Me Be Gone” printed at the bottom of this design. The Blurryface zip up hoodie features a large white box on the front with the band name in the box. The back features the same design with one of the patterns from the Blurryface album cover. The design is printed on a black zip up hoodie. 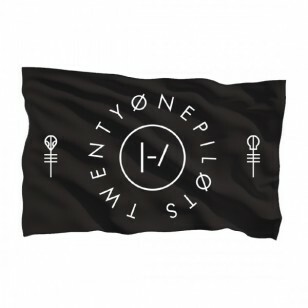 The 'Clique Circle' Flag features the band name printed around the band logo. On both ends of the flag are the skeleton clique logos. The design is printed in white on a 5'x 3' black flag. THE TWENTY ONE PILOTS ‘FPE’ GOLD NECKLACE FEATURES THE RECOGNISABLE “FEW, PROUD, EMOTIONAL” LOGO ENGRAVED INTO A GOLD PLATED CIRCLE CHARM. THE CHARM IS APPROXIMATELY 0.6 INCHES IN DIAMETER AND SITS ON A 20 INCH ADJUSTABLE EXTRA THIN CHAIN.